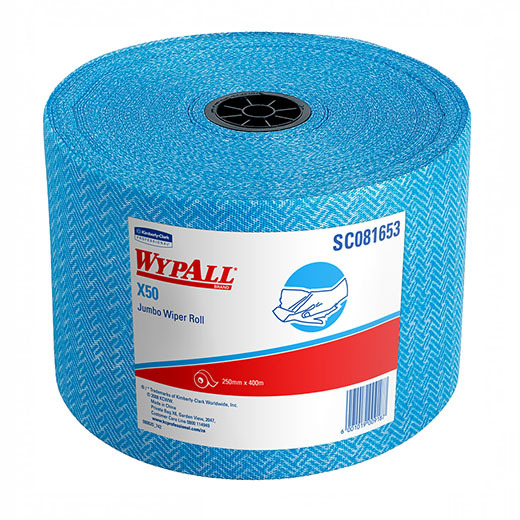 The reusable Wypall X50 jumbo wiper rolls are absorbent and solvent resistant and strong enough to tackle tough tasks, whilst also designed to be cost and time efficient. The Wypall X50 wiper with Hydroknit technology is highly absorbent - able to absorb up to 6 times its own weight. The jumbo roll offers 400m of wiper making highly economical as you can utilize only the amount of wiper you need for a given task. The X50 is certified for food contact making it ideal for use in food handling applications, but it is also suitable for other industrial applications in the automotive, manufacturing and cleaning industries.